104 Lighthouse Drive Jupiter, Fl 33469 has been sold. You can view available homes in Jupiter Inlet Colony. STUNNING 2 STORY 4 BR/4.5 BA ESTATE ON THE SPARKLING TURQUOISE WATERS OF THE INTRACOASTAL WATERWAY IN PRESTIGIOUS JIC. VIEW OF THE HISTORIC JUPITER LIGHTHOUSE FROM YOUR LUSH TROPICAL BACKYARD...WITH THE OCEAN AND PRIVATE BEACH JUST STEPS FROM YOUR FRONT DOOR. ROOM FOR UP TO 80' VESSEL ALONG WITH 24,000 LB LIFT ON 104' OF WATER FRONTAGE WITH DIRECT OCEAN ACCESS. OVER 5,500SF OF FLOWING INTERIOR SPACE PLUS OVERSIZED A/C GARAGE WITH FULL PRIVATE GYM. PATIOS AND PORCHES FOR OUTDOOR LIVING AND ENTERTAINING. NATURAL CORAL STONE FLOORING, BEAUTIFULLY CRAFTED DRIFTWOOD KITCHEN AND BAR ROOM WITH MIELE AND SUBZERO APPLIANCES, GAS FIREPLACE, HIGH VAULTED CYPRESS TONGUE AND GROOVE CEILINGS AND SERENE EUROPEAN EDGE POOL. COME...MAKE THIS HOME YOUR PRIVATE OASIS & ENJOY THE LIFESTYLE YOU'VE EARNED! 104 Lighthouse Drive located in Jupiter, FL is a single family home with 4 bedrooms, 4 full baths and 1 half baths.The Home at 104 Lighthouse Drive was built in 1997 in Jupiter Inlet Colony and offers a 3 car garage. 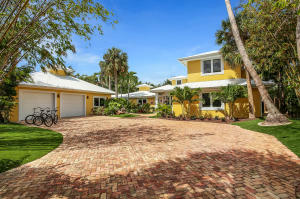 This Jupiter Inlet Colony Home offers boating, tennis, bike - jog, clubhouse, beach club available. 104 Lighthouse Drive Jupiter, Fl is currently listed for $6,700,000 under the MLS# RX-10424067. This Home has been put on the Jupiter MLS system and currently has a status of SLD.